Most travelers fly into either the capital of Cairo or Alexandria on the Mediterranean Coast, though you can get flights into the historic center of Luxor as well. 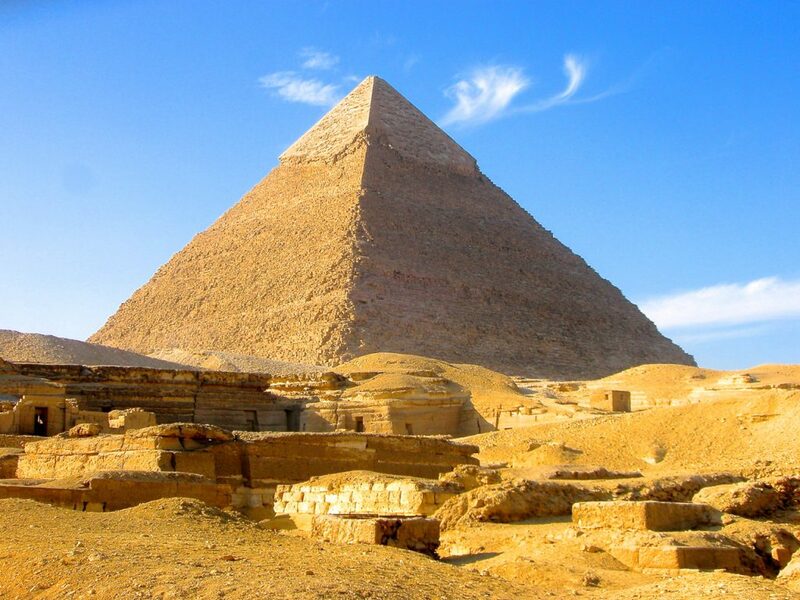 Visit the Pyramids at Giza- Obviously, a MUST SEE on any trip to Egypt. Hire a camel or a horse for a tour around the massive complex- it’s impossible to see it all on foot. 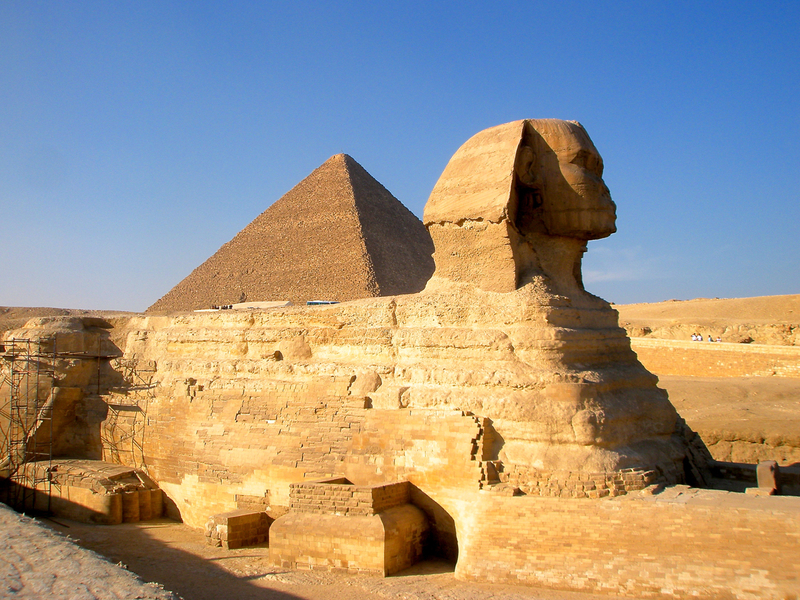 Make sure you get to the Sphinx- another Giza icon. Hang out along the Nile- The Nile River IS Egypt in many ways- wherever you are, it always has its own place in local history and legend. One of the world’s iconic rivers, an afternoon watching the fellucas float by along the Nile is an afternoon well spent. 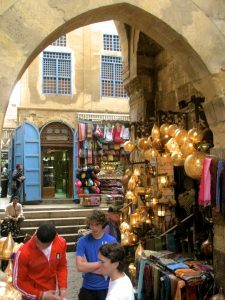 Walk through Khan el-Khalili- a massive bazaar in Cairo that dates back to the 14th century, Khan el-Khalili is a must see when in Cairo, if only to take in the hundreds of shops, kiosks, stalls, and cafes. It is an experience in-and-of-itself- a time warp of sorts back into ancient Cairo. Spices, souvenirs, decorative lamps and lanterns, textiles, dress shops, jewelry and fragrance vendors- it goes on, and on, and on... It’s pretty awesome, even for the anti-shopper. A cup of tea and a smoke on a shisha pipe, watching the rest of the world bustle by- iconc Khan el-Khalili. Explore Old Cairo- Old Cairo in is the center of Coptic Cairo- old churches and museums built by the early Christians in Cairo. Several interesting churches, museums, and mosques to wander through. Dive the Red Sea- The Red Sea has long been one of the world’s premier scuba diving destinations. Packed with world-class dive sites, the coastal towns of Dahab and Sharm el-Sheikh cater to divers of all budgets and capabilities. 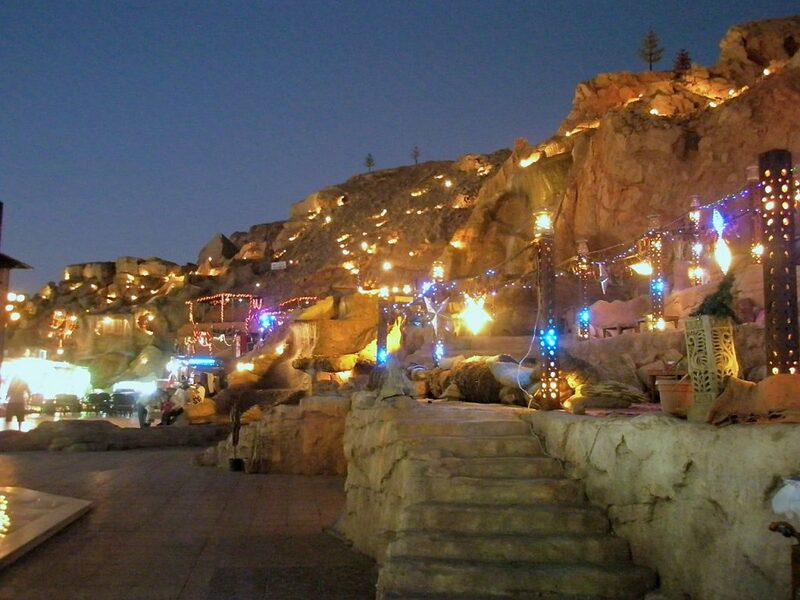 Sharm tends to skew a bit higher end, while Dahab caters to the budget traveler. Some of the top sites include The Blue Hole and The Canyon (Dahab), and the SS Thistlegorm and Ras Mohammed National Marine Park (Sharm). Hit up a few different dive shops, compare prices, and strike a deal on a dive package. Dive shops can provide transportation between the two dive centers. 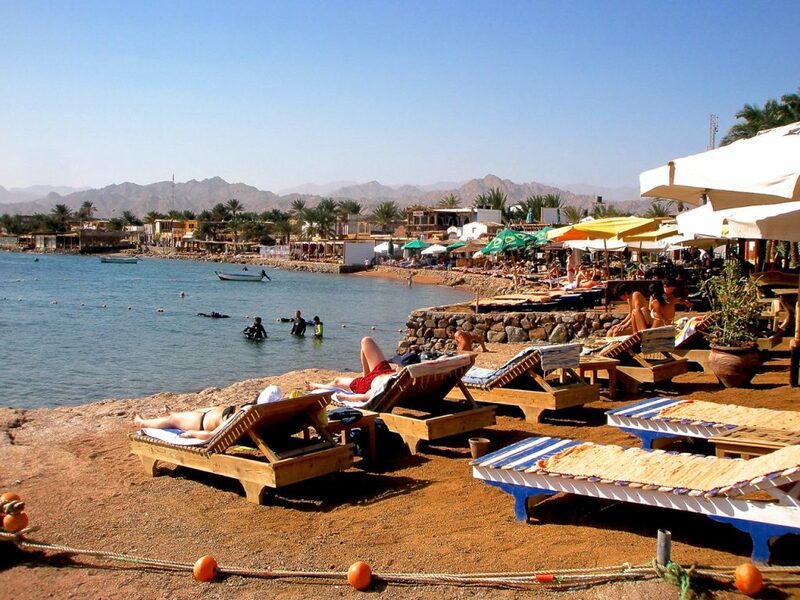 If you’re staying in Dahab and go diving out of Sharm (or vice-versa), be aware that there is a decompression time requirement before heading back after your days’ diving. Not to worry- it gives you a chance to explore these two tourism-oriented towns, where there is always a market to wander through. Many guesthouses and hotels in Dahab will give you deals on accommodation if you book your dives through their dive shop. Ask around before settling on a place to stay or dive. Overnight train service between Cairo and Luxor is great. Save on a night’s accommodation by sleeping on the train overnight. Cairo is awesome, an amazing city to just get out and walk around. Just be aware of the local shop owners that will try to get you into their stores by striking up a seemingly innocent conversation while you’re wandering along the streets. Along the same lines, be aware that day trips booked through an agent may include stops at papyrus factories, perfume shops, and other local craft stores- they earn a commission if you buy anything. Some of these are interesting, some are not. If you don’t intend to buy, don’t even ACT like you’re interested in anything- the vendors will be ALL OVER YOU. 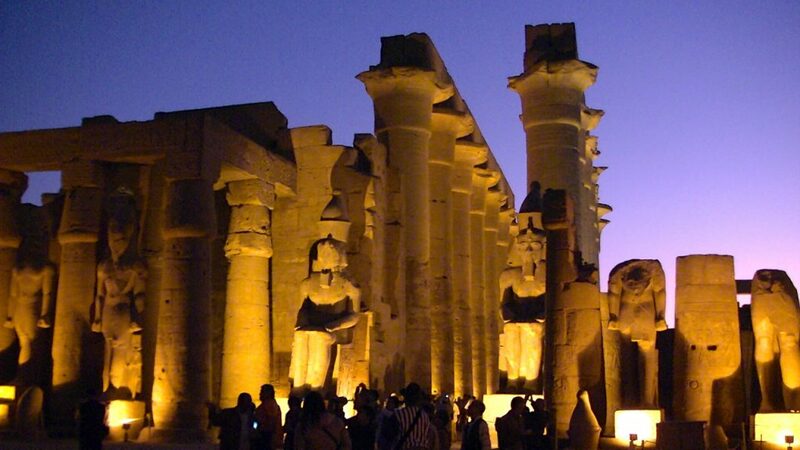 Luxor Temple is best visited at night, when the temple is lit up. A unique viewing experience, for sure. As mentioned above, dive shops regularly provide transportation for divers between Dahab and Sharm el-Sheikh- just make sure this is negotiated as part of the whole package when booking dives that require transport to and from town. The overnight bus service from Luxor to Dahab is a long one- 17 hours. After such a long ride, your nerves are sure to be shot upon arrival at your destination- just be aware that there will be countless touts, taxi drivers, and hotel representatives waiting for you to step off the bus. No, that’s wrong... Actually, they don’t wait for you to get off the bus- they climb ONTO the bus to mercilessly assail you with offers of free diving trips, discounted nights’ accommodation, free breakfasts- anything and everything. Just be prepared to say NO, get off the bus, collect your bags, and get on your way.